Le Festival international du film de Durban a annoncé que sa 31ème édition aura lieu du 22 Juillet au 1er Août 2010. 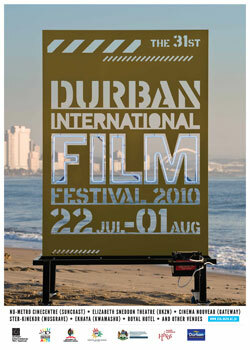 The Durban International Film Festival has announced that its 31st edition will take place from 22 July to 1 August 2010. The festival will present over 200 screenings of films from around the world, with a special focus on films from South African and Africa. Screenings will take place throughout Durban including township areas where cinemas are non-existent. 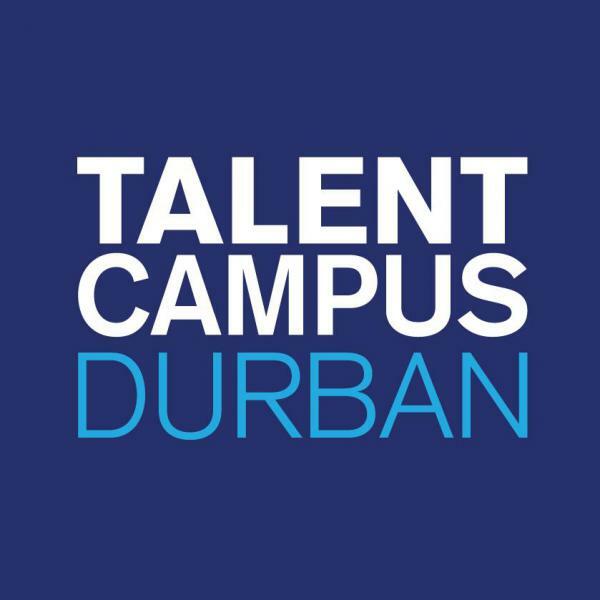 The festival will also offer an extensive seminar and workshop programme featuring local and international filmmakers, and the return of the very successful Talent Campus Durban. screenings at venues across Durban and in surrounding communities. workshop and seminar programme, as well as training and industry events. aboard as a principal funder. The festival will open with the world premiere of Khalo Matabanes State Of Violence, a powerful tale of revenge, history and memory. The closing film is Josh Appignanesis hilarious comedy, The Infidel, about a British Muslim who discovers that he was born Jewish. from new talents, superb new works by established masters, award-winners from around the world, and an unprecedented number of world premieres of new South African films. Above All, the recent Cannes hit directed by Oliver Schmitz (Mapantsula, Hijack Stories). South African feature films making their debut at the festival are Jahmil XT Qubekas stylish and original A Small Town Called Descent, starring Vusi Kunene and Hlubi Mboya, Jann Turners much-anticipated follow-up to White Wedding, Paradise Stop which features Rapulana Seiphemo and Kenneth Nkosi, the hilarious Attack Of The Indian Werewolf by Masood Boomgard, Jyoti Mistrys striking experimental film The Bull On The Roof (Le Boeuf Sur Le Toit), Regardt van den Berghs charming The Incredible Adventures Of Hanna Hoekom (Die Ongelooflike Avonture van Hanna Hoekom), the gangland action film Jozi Kings by Jonathan Boynton-Lee and Jamie Ramsay, the inspirational Machansa by Muntu Zwane, and the quirky romantic comedy Visa/Vie by Elan Gamaker. Raoul Peck, the acclaimed director of Lumumba and Sometimes In April, will visit the festival to present his new masterpiece, Moloch Tropical, a searing satire on political dictatorship. Chadian Mahamet-Saleh Harouns A Screaming Man, recent Jury Prize-winner at Cannes, is a devastatingly powerful film about the complicated relationship between a father and his son set against the backdrop of civil strife. The White Ribbon, Michael Hanekes vision of an early 20th century German village in which disturbing acts of cruelty take place, is both terrifying and masterful. Palestinian Elia Suleimans The Time That Remains is an astute and surprisingly funny look at the Palestinian struggle. In one of the years most controversial films, Michael Winterbottom x-rays the mind of a sadistic killer in The Killer Inside Me which stars Casey Affleck, Jessica Alba and Kate Hudson. Also courting controversy is Four Lions by Christopher Morris, which finds hilarity in the misguided efforts of a group of British jihadists who collectively decide to become suicide bombers. Produced by Indian megastar Aamir Khan and directed by Anusha Rizvi, Peepli Live is a hilarious comedy about the media frenzy, political hypocrisy and general mayhem that come about when a poor farmer undertakes to commit suicide in order to save the family farm. In a remake of the Coen Brothers Blood Simple, Chinese master Zhang Yimou follows the success of Hero and The House Of Flying Daggers with energetic and dark A Woman, A Gun And A Noodle Shop. In White Material, featuring extraordinary performances by Isabelle Huppert, Christopher Lambert and Isaach De Bankole, Claire Denis has created a riveting and politically complex film about a Frenchwoman desperately trying to hang on to her coffee plantation in an unnamed Africa country in the throes of revolution. Mohammad Rasoulof (The White Meadows). Alongside these experienced filmmakers, DIFF 2010 will introduce South African audiences to the new generation of auteurs. Exciting new talents include Xavier Dolan (I Killed My Mother), Anocha Suwichakornpong (Mundane History), Cherien Dabis (Amreeka), Arvin Chen (Au Revoir Taipei), Nicolo Donato (Brotherhood), Sophie Letourneur (Chicks), Paz Fabrega (Cold Water Of The Sea), Giorgos Lanthimos (Dogtooth), Christopher Morris (Four Lions), Adrien Binez (Giant), Daniel Barber (Harry Brown), Alvaro Pastor and Antonio Naharro (Me Too), Sherman Ong (Memories Of A Burning Tree), Claudia Llosa (The Milk Of Sorrow), Doze, Niu Chen-Zer (Monga), Dai Sako (Running On Empty), Shalizeh Arefpour (Heiran), Umesh Vinayak Kulkarni (The Well), and Debra Granik (Winters Bone). made up five contemporary Swedish films under the banner Swedish Film Is Here, and five films by the great Ingmar Bergman in the section Swedish Film Is Bergman. Swedish Film Is Here is made up of the outstanding debut Sebbe by Babak Najafi, Jesper Gansladts tense The Ape, DIFF regular Lukas Moodyssons Mammoth (starring Gael Garcia Bernal and Michelle Williams), Tarik Salehs exquisite animated film Metropia, and Niels Arden Oplevs much-anticipated The Girl With A Dragon Tattoo based on the bestselling novel. In Swedish Film Is Bergman five of the great masters films will be presented: Smiles Of A Summers Night (1955), Wild Strawberries (1957), Winter Light (1963), Cries And Whispers (1973) and Fanny And Alexander (1982). DIFFs documentary programme provides sharp insight into a spectrum of African realities, such as the inner city conflicts and concerns dramatically addressed in the world premiere of Rehad Desais The Battle for Johannesburg, and inside stories from Cape Town informal settlements in When The Mountain Meets Its Shadow. Fields articulate exposition of how the sports boycott became a turning point for political change in Have You Heard From Johannesburg: Fairplay, while David Forbes The Cradock Four covers the story of the abduction of four leading activists and their murder in June 1985. Savo Tufegdzics Sons Of The Sand The Strini Moodley interview is a riveting testament to the co-founder of the Black Consciousness Movement, while RFK In The Land Of Apartheid A Ripple Of Hope tells of Robert Kennedys historic visit to South Africa during the oppressive 1960s. trains; the Foster brothers My Hunters Heart journeys with the Khomani San as they try to recapture some of the knowledge and skills of their ancestors. Other offerings include miracles of the mind in Renée Scheltemas Something Unknown Is Doing We Dont Know What; Steve Kwena Mokwenas aesthetic meditation on postcolonial Africa in Driving With Fanon; Mzimasi Govas reflection on golf development in black townships in The Fairway; Josh Sternlichts Fool In A Bubble, which is a candid exploration into the journey and conflicts of cult Durban musician/poet, Syd Kitchen; and Letters From Teddy, Terry Westby-Nunns poignant story set against the backdrop of British colonial society in Aden in the 1950s. while Tehran Without Permission, shot entirely on a cellphone, captures the character of the city in the run-up to the controversial elections of last year. The Shock Doctrine is Michael Winterbottom and Mat Whitecrosss cinematic interpretation of Naomi Kleins bestseller and outlines the rise of disaster capitalism. exploitative world of high fashion modelling, The hilarious and poignant Winnebago Man reveals the story of Jack Rebney (a.k.a. the angriest man in the world), who turns out to be more savvy, deep, weird, and co than anyone could have imagined. Additionally, a number of short documentary packages offer a variety of revealing insights into Ugandan and Nigerian society, and of course South Africa. Filmmakers are key agents in keeping a watchful eye on threats to human ecology and environmental balance in films such as Scientists Under Attack, and South African Carlos Franciso's American Foulbrood. When the water that comes out of your taps turns to flame you know something is wrong Gasland explores the shocking consequences of massive natural gas drilling across the USA. On a highly positive note the multi-award winning Waste Land witnesses the creative production that results when art and poverty collide at the worlds largest rubbish dump in Brazil, while the 4th Revolution: Energy Autonomy outlines the tantalising possibility of switching to 100% renewable energy sources in the next 30 years. flagship screenings in DIFFs community programmes. The line-up includes award winning South African film Father Christmas Doesn't Come Here, and the winner of the Berlin Today Award 2010, Jonah And The Vicarious Nature Of Homesickness, as well as a crop of hot films made by emerging AFDA film students. The Latitude package, supported by the Goethe Institut, presents an excellent array of 9 contemporary African films which includes Jan-Hendrik Beetges Abyss Boys, recently named best short film at the African Movie Academy Awards in Nigeria. The Wavescapes Surfing Film Festival has been a popular presence during DIFF for the past 5 years, with poetic eulogies about waves and the heroes of the surfing sub-culture and great surf action. Wavescapes kicks off with the star all-women cast of Dear and Yonder at the free outdoor screening at the Bay of Plenty on Sunday evening of 25 July, followed by five days of the latest, hottest new surf films at Musgrave Ster-Kinekor. Optimising the presence of filmmakers and industry experts, DIFF offers a packed programme of seminars and workshops aimed at both aspirant filmmakers and professionals. An open and free workshop programme takes place daily at The Royal Hotel. Closed programmes include the 3rd Talent Campus Durban which brings together 40 filmmakers from 20 different African countries, the 9th UKZN Audio Visuals week-long workshop for first-time filmmakers, and the inaugural edition of the Durban FilmMart, a film financing and co-production initiative in partnership with the Durban Film Office. Involving local and international producers and film financiers, the Durban FilmMarts Finance Forum and Producers Forum will provide capacity-building programmes and business networking opportunities to stimulate industry development and filmmaking in Africa. Allied to industry stimulation are DIFF audience development initiatives to broaden public access in community based venues, and a Film Literacy programme for schools in the Inanda-Ntuzuma-Kwamashu area of Durban. Theatre; Nu Metro Cinecentre - Suncoast; Ster Kinekor Junction Musgrave; Cinema Nouveau - Gateway; Ekhaya Multi-Arts Centre in KwaMashu; and The Royal Hotel, with further screenings in township areas where cinemas are non-existent. Call 031 2602506 or 031 2601650 for further details. 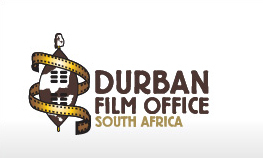 The Durban International Film Festival is organised by the Centre for Creative Arts (University of KwaZulu-Natal) with principal support by the National Film and Video Foundation, KwaZulu-Natal Department of Economic Development, HIVOS, Stichting Doen, the German Embassy, the Goethe Institute, the City of Durban and the Industrial Development Corporation.